The European Commission has funded SOPHIE, a research programme which will help protect the ocean, harness its health benefits, and reduce its risks by bringing together marine and environmental scientists with medical and social scientists, public health and other experts. Coordinated Support Action (CSA), BG-06-2017: Interaction between people, oceans and seas: a strategic approach towards healthcare and well-being. 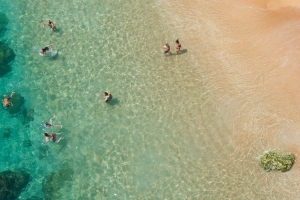 The central aim of the proposed Seas, Oceans and Public Health in Europe (SOPHIE) Coordination and Support Action (CSA) is to advance significantly the coordination of multidisciplinary research and training in Europe to better manage the risks and opportunities presented by the complex interactions between the marine environment and human health and wellbeing. In doing so, SOPHIE will bring together researchers and practitioners from across two largely disparate communities: (i) the marine and maritime community; and (ii) the medical and public health community. SOPHIE will create a platform for these communities to work together to better understand both the potential threats to human health from degraded marine environments and the opportunities for human health promotion from sustainable interactions with coastal or ‘blue’ environments. In doing so, SOPHIE will build in Europe a coordinated community of researchers and practitioners within the relatively new and integrated meta-discipline of ‘Oceans and Human Health’ (OHH). SOPHIE’s primary aims are to: a) deliver a clear, evidence-informed Oceans and Human Health Strategic Research Agenda (SRA) within the European context, based on extensive involvement by diverse stakeholders; and b) ensure that the structures needed to develop and implement this SRA are in place and will exist as a legacy beyond the life of the project. EMB is leader of Work Package 6 “Building a Future Policy-Relevant Oceans and Human Health Research Effort in Europe” and will also contribute to WP1, WP2 and WP3. The main output of WP6 will be a Strategic Research Agenda for Oceans and Human Health in Europe which will be published at the end of the project. If you want to find out more about our work in oceans and human health, you can do so here. You can find the news release about this project here.